With all great players, there is a self-motivation that drives them to do the marvelous things they do on the ice. For New Jersey Devils forward Patrik Elias, there's no stereotype. He's a flashy Czech playmaker who has the grit to go to the net, get into a goal-scoring hole or fire from long-distance and still be effective. Most importantly, he's just as valuable killing penalties and playing his position 5-on-5. "It's pretty easy to tell you what makes Patrik Elias tick," Devils GM Lou Lamoriello explained. "He wants to be the best at what he does. He doesn't so much compete against the others players as he competes against himself." Getting the most out of oneself. It takes a drive, a passion, A reason. Every player has obstacles to overcome to get to this high level. If you ask the 32-year-old from Trebic, Czech Republic, he'll look you square in the eyes, then raise his voice just a notch to underline the importance of the words he speaks. "I'll never forget the words," Elias told me. "I was with Kladno in the Czech Elite League and I told them I was going to North America to try to make it in the NHL. I'll never forget one of the coaches saying to another member of the staff after I walked away, 'He'll be begging us to take him back.' "
What were the best stories of 2008? Kukla's Korner: What's your team's ID? While those words were spoken more than 14 years ago, Elias lets them drive his every breath-taking move. There was no return to Kladno. 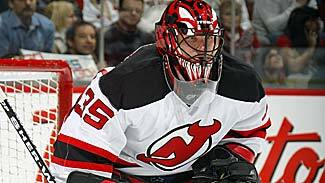 While Elias had to spend the better part of two seasons with Albany of the American Hockey League at the start of his career in North America, he made it big when Robbie Ftorek, who had coached Elias in the AHL, became coach of the Devils. That was 1997-98, when Patrik had 18 goals and 19 assists and he was named to the NHL's All-Rookie team. Other notable achievements have included his League-leading plus-45 in 2000-01. But the bottom-line result that Elias is most proud of are Stanley Cups in 2000 and 2003 and the fact that his 39 playoff goals are a club record, not to mention that his 110 career playoff points are 35 more than any other Devils player. Elias succeeds in the postseason because he has a knack for delivering in the biggest moments --think the famous no-look pass to linemate Jason Arnott in double overtime of Game 6 against Dallas to give the Devils a 2-1 victory and the Stanley Cup. In recent weeks, he has continued that overtime magic to surpass Jaromir Jagr, Mats Sundin and Sergei Fedorov for the all-time record of 16 overtime goals. "I just try to relax," Elias said with a smile. "I just try to settle the play down and wait for my chance. I love to be in the position when the game is on the line. In the clutch, I want to work the puck ... and to try to create a good scoring opportunity." "With some players, they just feed on the pressure to make a play -- and Patty's like that," added Devils captain Jamie Langenbrunner. "He a clutch player. He really steps up and elevates his game." "I was with Kladno in the Czech Elite League and I told them I was going to North America to try to make it in the NHL. I'll never forget one of the coaches saying to another member of the staff after I walked away, 'He'll be begging us to take him back." He's quick. He's fast. Like most European players, he's very good at making things happen because he learned how to play the game on the bigger ice surface, where he'll find a shooting or passing angle on an opponent. His vision and ability to see a play like a chessmaster -- two or three plays ahead of time -- is incredible. New Jersey Devils coach Brent Sutter describes Elias as a hunter on the ice when a game is on the line. It's an apt description, according to St. Louis Blues defenseman Jay McKee. "Some of the best players in this League can be defended because they slow down, hesitate. Not Patrik Elias," explained McKee. "He's special because he's so smart ... with the puck or without it. He never stops moving. You've always got to keep an eye on him because he's always hunting for an open spot to create a play." "I'll never forget having to go against him in the 2001 Stanley Cup Final when I was with Colorado," Blues forward Dan Hinote recalled. "He is so good at protecting the puck that you couldn't get it away from him ... and he's one of those guys who only needs one chance to make you pay." Devils defenseman Bryce Salvador said he only remembers playing against Elias a couple of times when he was with St. Louis in the Western Conference. Seeing him every day gives Salvador a greater appreciation of the skills and smarts Elias possesses. "I've played with a lot of smart players over the years, but Patty's really special. I've never seen a star player watch so much video to try to get an edge on an opponent," Salvador explained. "He'll be watching the game of a team we're about to play and he'll yell at me, 'Hey, look at this!' If he sees something that will help me, he let's me know about it. "With Patrik Elias, you see the skill right away. Then you notice he does everything well ... in every facet of the game." The Elias story began in a small Czech town, where Zdenek Elias, a housebuilder, and his wife, Zdena, who cleaned homes for a living, made sure their three sons got a chance to be boys -- even if Patrik always wore his older brothers' hand-me-down clothes. They all played soccer like their dad. But it didn't take long for Patrik to show everyone how skilled he was in hockey. When he was 14, he had a very difficult decision to make on whether he was ready to move away from home to pursue his hockey dreams. Elias remembers that decision fondly, "My parents said, 'Go ahead and give it a shot in hockey.' Their confidence in me really meant a lot." Even though he was homesick at first, Elias went to the same academy in Kladno that Czech hero Jaromir Jagr called his hockey home. That's where Elias first met Petr Sykora, long before the duo combined with Arnott on the highly productive A-Line during the Devils' Stanley Cup runs in 2000 and 2001. "Patty was about a buck-27 at the time, but he never backed down from anybody," Sykora recalled. To which, Elias added, "When I was growing up, I was almost always the smallest guy on the team. But I didn't let that bother me." Playing in the Czech Elite League was Elias' dream. There was no NHL on TV where he came from. In fact, he didn't start thinking about the NHL until he was 16 and was playing on the Czech national team and he'd hear about scouts from the NHL watching some of his team's better players. In 1994, when he was 18, this 168-pound hunter was picked in the second round of the Entry Draft (No. 51) by the Devils. It was at that time that Jagr, who had been Elias' favorite player, was replaced by Detroit captain Steve Yzerman as the player he most liked to watch. "You saw his great skills," Elias explained. "But what I liked most about him is the way he carried himself as a leader of the Red Wings." Sounds a lot like how others describe Elias now, doesn't it? "There another side to Patty, too," said Arnott, now the captain of the Nashville Predators. "He's a character. He loves joking around, playing pranks. He loves reciting lines from movies like 'Dumb and Dumber' and 'Austin Powers.' He's fun to be around. "Ask him about his dog," Arnott continued. "After we lost Game 4 to Toronto in the 2000 playoffs, he went home and chased his Labrador retriever around his condo to take his mind off of losing 3-2 that night. There he was on all fours in his living room, barking right back at his dog. He's got a way about him to remove pressure; and that was one of the funniest." "That's me," Elias says. "If you make things too serious, you're not going to able to do your job. I have fun on and off the ice. You should enjoy yourself." But hockey as a business isn't just one joyride -- as Elias found out during the lockout in the summer of 2005, when he was playing in Russia. It was there that he contracted Hepatitis A and there was fear that the illness might end his career. Not this self-motivated player. After missing the first 39 games of the 2005-06 season, he kept his point-per-game average with 16 goals and 29 assists in just 38 games. "I don't even think I realized how sick I was," Elias explained. "I didn't realize how dangerous it was." He found out later that if he had a vaccine, the effects of hepatitis wouldn't have been so hard on him. That's also when Elias learned of many other cases where people don't get the right treatment -- and that led Patrik to become a goodwill ambassador for the U.N Children's Fund (UNICEF). He makes it a point each summer to go to a foreign country and help out however he can. "You get older, you have more of an opportunity to help others," Elias said. Patrik's trying to recruit other athletes to follow his lead. Last summer, Boston defenseman Zdeno Chara followed Elias to Belize in Central America. "Travel brochures will show you the nice beaches and photos of the waterfront, but there were orphanages there that had just 18 beds ... but housed 60 children," Elias told me. The poverty is so bad." We've heard how special Patrik Elias is as a player, but at 6-foot-1, 200 pounds, he has also built a life for himself in this far-away land, aside from being a big-game player. And, just as importantly, he's grown as a man.